Working with NBC 24’s Allison Peters and camera crew Jose Degollado was incredible! Allison made us feel like a real television stars! 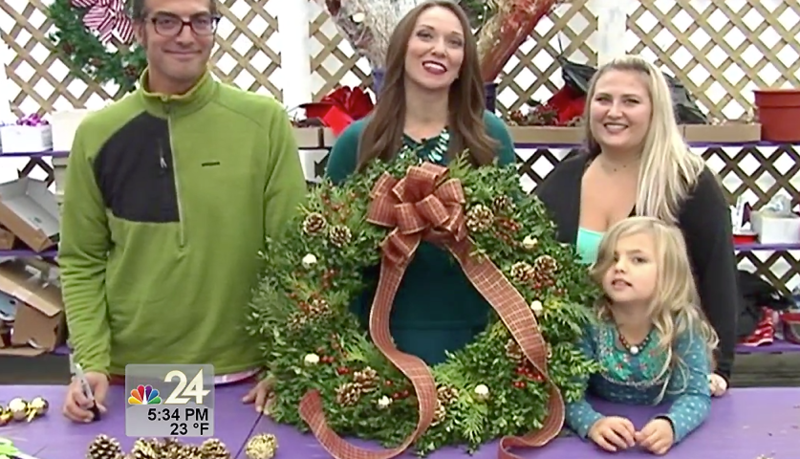 Allison contacted Whiteford Greenhouse just before Thanksgiving asking if we would like to be featured on Channel WNWO 24 “Life is Better Here” segment featuring our Handmade wreaths, custom decorating, along with our many other holiday products. The segment aired December 9, 2016. We talked about how we are eighth generation family business and how we provide the Toledo & Sylvania area with the highest quality patio pots & beautiful landscape all year round. We instructed Allison on how to assemble & decorate a handmade live wreath. Whiteford Greenhouse’s Grower & Designer, Jacob Urrutia, demonstrated pro-decorating tips and tricks to decorate our freshly made boxwood wreath. With our demo, Allison made a beautiful handmade custom wreath to enjoy all season long! During our interview Allison was so sweet to check Cypress’ hair and makeup, even gave us some pro tips that we can use for our video tutorials! Jose was more then patient with our many video takes as I stumbled over my words to get to the path of “tv”perfection. They were both so professional, and made us feel so comfortable being in the spotlight! It was an amazing experience and we hope to have another visit by the NBC Life is Better Here crew in the spring! Thank you again for taking the time to get to know our business and the family behind Whiteford Greenhouse… Buy your plants where they’re grown!